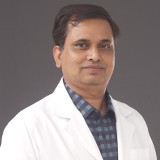 Dr. Arvind completed his MBBS from All India Institute of Medical sciences (AIIMS), Delhi, India followed by an MD in Dermatology, Venereology & Leprology from Lady Harding Medical College, Delhi, India. Dr. Arvinds professional experience includes over 4 years of experience as a consultant dermatologist in Valencia Hospital and Centre for critical care and the Skin and Laser Clinic in Faridabad, Delhi. Dr. Arvinds dermatosurgery experience includes skin biopsies (excisional, punch, shave etc), scar revision surgery, nail surgery, PRP for wound healing and radio cautery for wart, payogenic granuloma, corn, nevus removal etc. He also has over 5 years of extensive experience in hair transplant surgery and laser procedures for wrinkle reduction, antiaging, acne scar, wart callus removal and ingrown nail surgery. His other areas of expertise include, platelet rich plasma (PRP), chemical peeling, microdermabrasion, scar modulating surgery, botox & fillers, dermaroller, radiofrequency microneedling and threading. He is a member of the Indian association of dermatologist venereologist and leprologist, Delhi medical council and he is also a member of association cutaneous surgeon of India. He speaks fluent English & Hindi.